For the moment, the usual media sources have tired of telling us that jazz is dead, but some anonymous blogger launches heavy satire that it is “the worst,” while another source reports that jazz is the least popular music on the planet. I find it difficult to care about such blurts . . . because beautiful performances and many new discs prove those slighting words untrue. 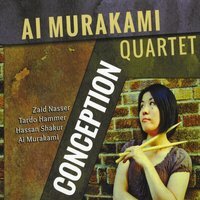 Today’s delight is drummer Ai Murakami’s CONCEPTION (Gut String Records) where she leads Zaid Nasser, alto saxophone; Tardo Hammer, piano; Hassan Shakur, string bass, through eight lyrically swinging performances: ON A MISTY NIGHT / CONCEPTION / SWEET LORRAINE / OLD DEVIL MOON / WHEN JOHNNY COMES MARCHING HOME / SAUCER EYES / WE’LL BE TOGETHER AGAIN / RAY’S IDEA. First off, although this is a drummer-led quartet, Ai is a percussionist more interested in propelling the group than in soloing. The two extended solos she takes, on SAUCER EYES and RAY’S IDEA, are each slightly more than a minute long, and are deliciously melodic displays of accents, rolls, and rimshots — compositionally deep, as one motif naturally builds into the next. Throughout this session, she plays “for the comfort of the band, ” creating a flowing swing tapestry for the quartet. She moves quietly around her set as the context changes, and her work is full of subtle colorations of sound that show how deeply and lovingly she listens to her colleagues. Pianist Hammer is one of the great lyrical players of this era, his work simultaneously definite and airy; bassist Shakur is a melodic player who keeps beautiful time and has a deep resonant tone; altoist Nasser is a post-Parker songbird with a citrusy tone, moving easily from one great lyrical paean to the next. This recording is “old-fashioned” in beautiful ways, which I write as a great compliment: it shows their respect for song offered in swinging ways. Melodies are caressed rather than demolished, and the result is gratifying mainstream jazz played in this century. It isn’t an attempt to reproduce great performances or familiar solos in better fidelity, but one could pass it off as a lovely unissued Prestige session and the collectors would be racing to buy copies. I asked Ai for her thoughts, and they are candid and modest. “First of all, I love each one of these players as a great musician. They have their own unique sound and their phrasing is so musical. I have worked with each member in different band situations and always enjoyed it. But when we played together for the first time, it was very different. I felt full of joy while I was playing as the band was so swinging. After several gigs together, I felt even better! Then I started thinking that I should do a recording with this band. I wanted more people to hear our music and feel like I do. The most significant tune for me on this recording is Conception, which is why I named my album after it! I always love this tune, but I don’t hear many musicians play it nowadays. So I wanted to try it on our recording. I guess it is a tough tune, but I’m happy about the way we sound on the recording. The drum trading was a bit complicated, but we nailed it! I really like the ending too. On our recording, I selected tunes the way I do for the gig. I wanted our recording to be like a good set, with various tempos, different feels, a mix of standards and bebop tunes… so that we enjoy our playing and hopefully our listeners do too. I’m quite happy about the way it came out. CONCEPTION is both an idea and a giving birth — here it is deeply satisfying lyrical music, a living embodiment of sophisticated swinging improvisations . . . the kind of rich music the media tells is finished. How wrong they are. You can learn more about Ai and her bands here. Posted in "Thanks A Million", Bliss!, Generosities, Jazz Titans, Pay Attention!, Swing You Cats!, That Was Fun!, The Heroes Among Us, The Real Thing, The Things We Love, Wow!